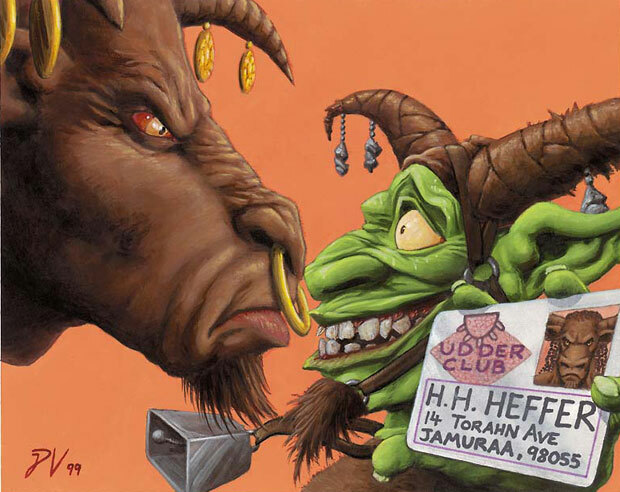 In 1994 I created a series of promotional images for Magic: The Gathering. These pieces were meant for flyers timed for the ’94 con season, and the game’s first anniversary. Unless you’re one of about a dozen people, you’ve never seen them before. To find out why, check out the prologue to this series. The project was to be six images, one for each color of mana (the cornerstone of power and flavor in M:TG) and one extra for today’s subject – Artifacts. This is the general layout of all the pieces in the series; a color-themed planeswalker centrally framed and playing Magic cards, surrounded by creatures (and occasionally spells) of the appropriate mana color (or colorless in the case of Artifacts). An interesting wrinkle to all of this was that in ’94 all of the Magic artists still retained the copyright to their images. I think the working logic for this project was that they were free handouts and so didn’t require any special agreements, but if they’d been on retail products, then they’d have had to pay all the applicable artists a royalty. I think. Hey, it’s 19 years ago! I just know that Jesper would have done right by the artists like he always did. Anyway, have fun trying to spot all of the cards referenced in this project. All six pieces pulled from cards from Alpha through The Dark. Feel free to post guesses here, on Facebook, Twitter or whatever Magic forum led you here. I’ll be curious to see if I’m able to sneak any by you. 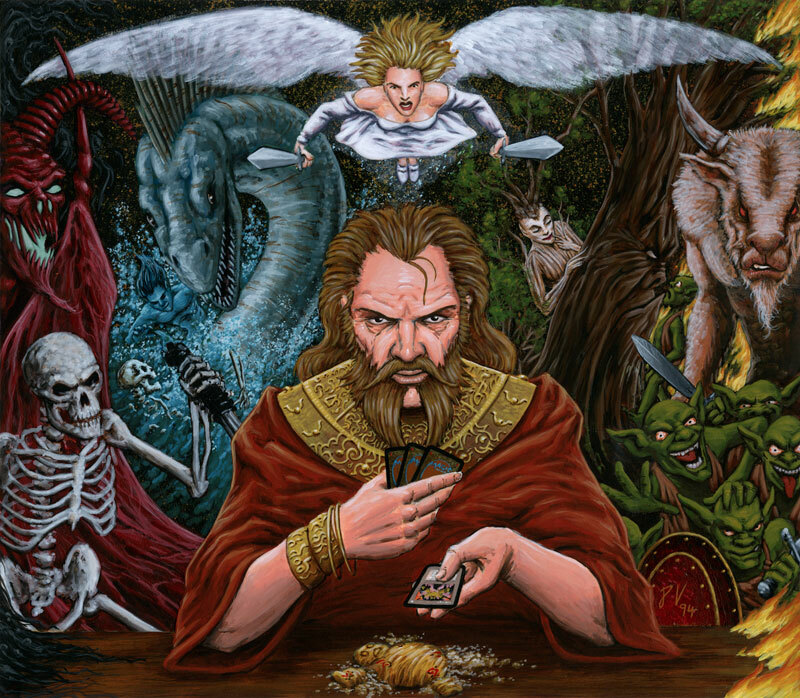 Were you able to name all the cards in the artwork? The answers are below. The next piece I’ll be debuting will be Red. Those of you that’ve read any interviews I’ve given, probably know that Red and Black are my favorite colors in Magic. So, we’re going to start at Red and work our way around the color wheel until we finish up at Black! Set the waaaay back machine to 1994. Many of you will be horrified to be reminded that was 19 years ago. I know I am. I’d just finished the artwork for Antiquities, Legends and The Dark and the original art director of Magic – Jesper Myrfors – asked me if I’d like to do the cover illustration for the first official Magic: The Gathering card binder. Of course, I jumped at the chance. I wanted the wizard to have no mana bias so I had him playing an artifact. Bonus: it meant I got to paint the Stuffy Doll! This was the first and only time I got to paint an angel on an official WotC product. This was the first time I painted goblins. The card backs were the hardest part because I’m fussy about little details like that. The piece is a fun bit of history for me but it also shows I was still trying to find my feet with painting. Take a look at the wizard’s hands and arms to see the iffy attempt at blending, let alone whatever’s going on with the Serra Angel’s forehead! To me, the painting’s greatest significance is as the catalyst for a larger project. I’ll get to that in a moment. 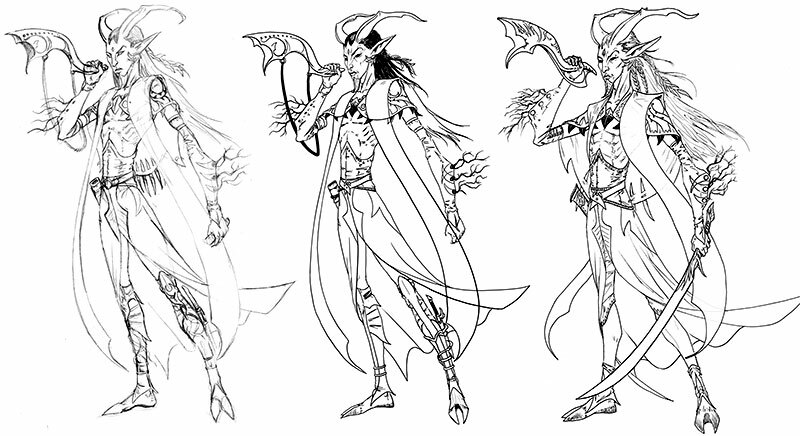 After the binder piece, the next job I did for WotC was 26 (!) paintings for the launch set of the Jyhad CCG (later known as Vampire: The Eternal Struggle, or V:TES). Then came Fallen Empires and I remember when I finished Armor Thrull, I was struck with how much I’d improved since those first few paintings only five months previous. One day, while on the phone with Jesper, (this was before people commonly used email to conduct business. Hell, it was ’98 before I had the internet in my home!) we got to talking about producing a series of flyers for Magic. These would be handouts for use at the major conventions and there’d be five different designs – one for each color of Magic. That soon became six designs as I pointed out that Artifacts deserved a flyer too. Jesper was very keen on the idea so I set to work on finding and combining some of the coolest creatures and spells from those first few sets of Magic. I’d flown to Seattle and visited WotC only a month earlier so I was privy to the wondrous imagery in the entire Legends set even though it was still a month or two until it was available in stores. Balancing a composition filled with a dozen or more disparate creatures only unified by their casting cost was no small task. But I loved it. It was a glorious jigsaw puzzle and it was only the very short deadline for such complex paintings that made the assignment so grueling. Finally when the paintings were complete, I tried to call Jesper because I still didn’t have a contract, but I had to leave voicemail. Time went by and I heard nothing. Eventually I got to talk to Sandra Everingham who I discovered had become the new art director for Magic. Jesper had quit, and unfortunately in all that chaos, no one had been told what I was working on. No one was expecting the work. There was no contract. Magic was clearly doing so well it didn’t need flyers. I never did get that contract. And I never got paid the $6,000 I was expecting to receive. Now, to be clear, I don’t hold any grudges over this. Jesper had bigger things on his mind when he quit Magic and WotC in 1994, and no one else even knew the pieces were being made so why would I be annoyed with them? Anyway, these six paintings have only been seen by a handful of people. They’ve NEVER been seen on the internet. Until now. Running twice a week starting this Thursday I’ll be debuting one of these pieces and we’ll be starting with that “Color #6” – Artifacts. Stayed tuned. And be prepared for a scavenger hunt to find all the cards referenced in these paintings. It’s quite a few. Comments Off on Minotaurs! No BS. I wrapped the artwork on Maze of Games a little over a week ago. The project became something much more intense, convoluted and altogether grander than we’d initially conceived. 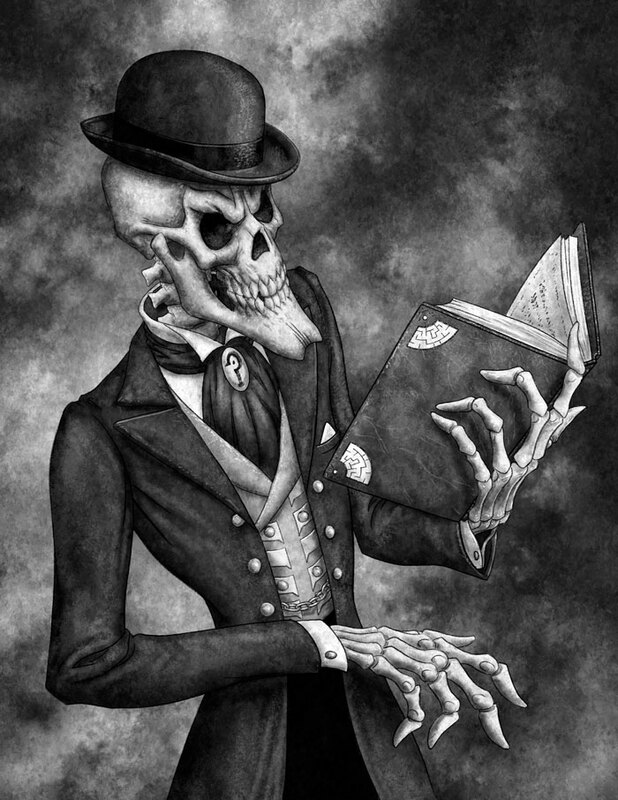 This is all for the good as the book’s author, Mike Selinker, has created a thoroughly fiendish puzzle-book (and novel). I sat down with Mike for a quick chat about the artwork, and you can read all about it in one of the Kickstarter updates. 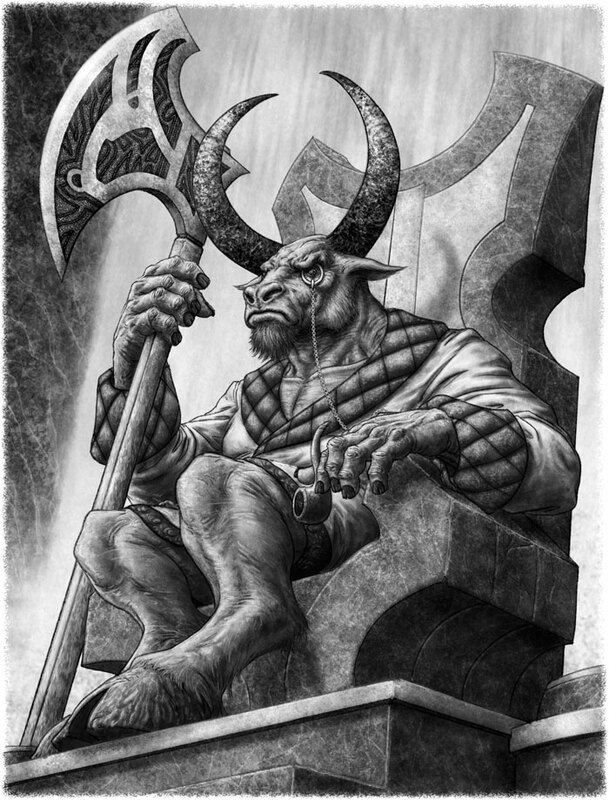 I’ve posted my favorite piece – a rather gentlemanly minotaur – but if you’d like to see more art, just follow the link above. Next up, have you ever heard of Magic: The Gathering‘s graveyard? No, not the one that’s in the game (or does it go by a different name now? I can’t keep up), but the art graveyard. This is where images that weren’t used on a card are placed in the hope of finding them a new home in another set. Usually these images find themselves without a home because the cards change a lot during development (which occurs at the same time as the art commissioning cycle) and sometimes the card they were created for is so radically changed that it needs entirely new artwork. The worst fate for a card is to be “graveyarded” in the final set of a block while featuring a visual element that can’t be used outside that block. I have a Nezumi (rat creature) card meant for Saviors of Kamigawa that shared just that fate and will probably never see print. 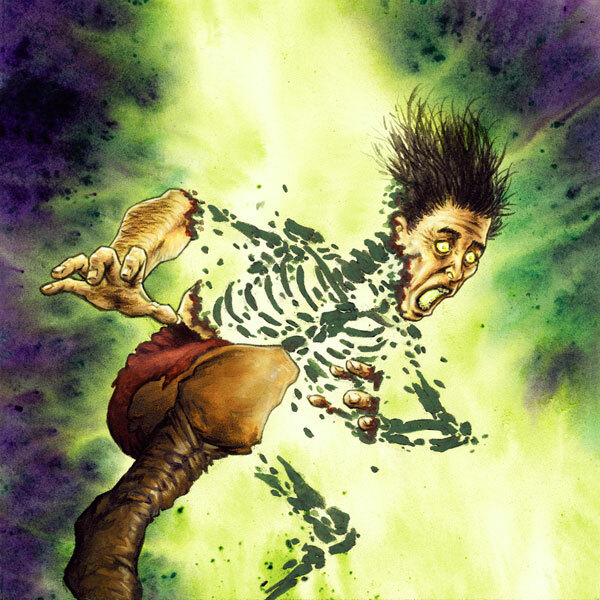 Still, the biggest graveyard incident I can recall is when Unglued 2 was postponed after most of the art was already commissioned (no, I don’t remember why) and when it finally rose again as Unhinged, a large percentage of the art in the set couldn’t find a new home in the radically re-jiggered card selection. I had three Unglued 2 cards suffer that fate. Bit of a surprise, but I’m happy to finally share this with you after… *peers at date on painting* …fourteen years! Good grief. Oh, and I take full responsibility for the dumb jokes and continuity nods in the details of the “Udder Club” membership card. Well, as you probably know, 2013 marks the 20th anniversary of Magic: The Gathering, and in the next couple of weeks I’ll be sharing with you some art that was the next thing I did for M:TG after I wrapped up the combined commissions of Antiquities, Legends and The Dark. These pieces have never been seen on the internet before and frankly very few people have ever seen the art. They’ve also never been in the Magic art graveyard because… well, that’s all part of the story that I’ll share with you in the very near future. The Maze of Games Launch! Comments Off on The Maze of Games Launch! 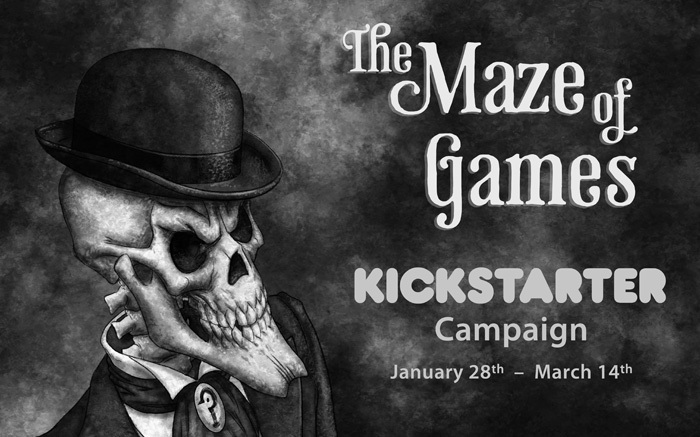 The Maze of Games – an interactive puzzle novel written by Mike Selinker and illustrated by me – has just launched on Kickstarter! Click the image below to head to the Kickstarter page! The images aren’t stickers they’re actually imbedded into the cases and are nice and solid. We got these done at Uncommon and they did a great job. 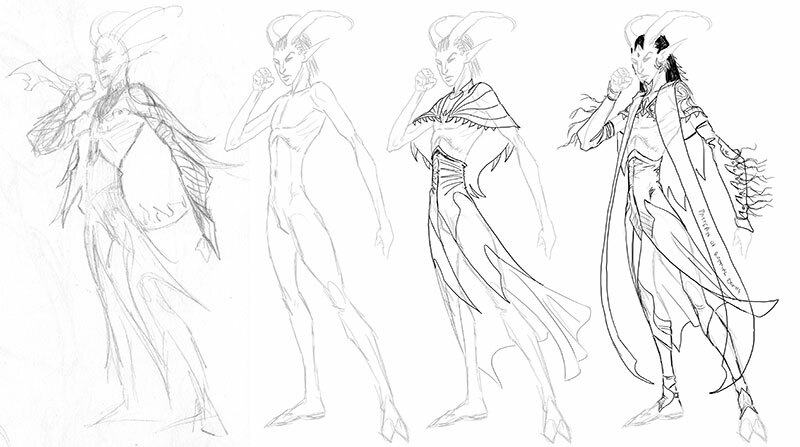 The one on the left is based off the designs I did for my wife’s site, Gothic Charm School. 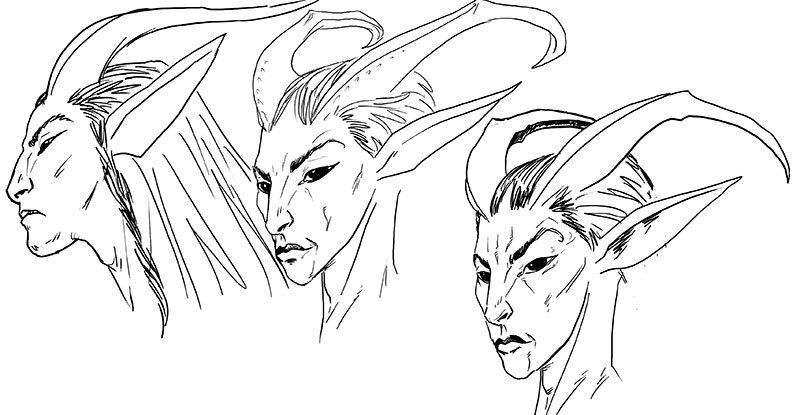 The one on the right is a tweaked version of my Skirk Marauder image. No, I can’t make the Skirk one available for purchase as it’s copyrighted to WotC, but one for my personal use is just fine. 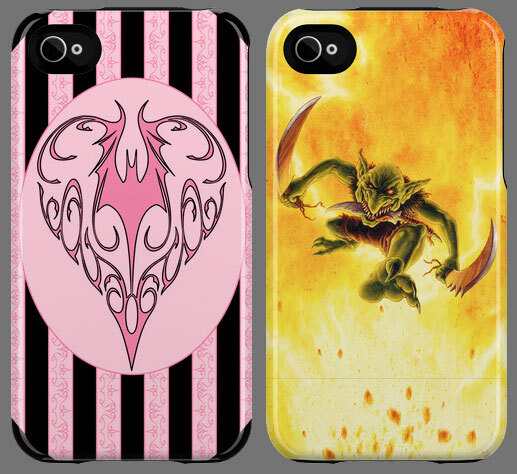 So, would you be interested in a phone case with some of my fantasy art? I certainly think it’s a cool new way for people to enjoy my art. Let me know. It’s Halloween, so time for a couple of suitably unpleasant pictures that – bonus! – you’ve probably never seen before. These images were both called ‘Doom’ and were destined for promo chips for the short lived game Clout which unfortunately folded before enough people could realize the game was so much more than Pogs and that even though some manual dexterity was required, the tactical aspects of the game were surprisingly meaty. Brr. Still makes me wince. Or maybe “That’ll Leave a Mark”. I find that damage that cuts along lines you don’t expect are always more unpleasant to our jaded slasher-movie-going tastes. That’s why rather than a clean separation of the head the energy slices through the back of the skull, and more importantly along the length of the jaw. This second piece was also my chance to use acrylic washes working wet on wet to create the energy blast. The green paint was applied first, then washed away and re-applied, rinse, repeat, until the color’s density was sufficient and nicely saturated but the edges were still soft. After leaving it overnight to ensure the green was fully dry the purple was added in washes to maintain the soft blurred edges that sell the gaseous quality of the effect. Perhaps it’s a dragon’s breath weapon? Working to get a good transition between such opposing colors as green and purple is always tricky because if the purple bleeds too far into the green, no matter what you do it’ll leave a trace and dull the green. I was mostly lucky and it looks like the only issue I had was in the lower right corner. That’s it for now. Hopefully I haven’t ruined your appetite for all that leftover Halloween candy. Waaaaay back in the dawn of time, well, early for Magic the Gathering but the rest of us know it as 1993… okay, that really does seem like a long time ago now. Damn. Oh yeah, in October 1993 on my very first trip to the United States I accidentally met Jesper Myrfors, art director for Wizards of the Coast, at Philadelphia Comic Fest. A month later I was working on my first Magic cards. Okay, apparently my brain is set to “off topic” today. Anyway, during early November of 1993 I worked on my six pictures for Antiquities. COP: Artifacts was my favorite for play value – I mean, how cool was it to do the one missing COP? – but my favorite image belonged to Gaea’s Avenger. The power was nothing special, but this was my first rare card (or ‘Uncommon 1’ but let’s not get into that) and it was my first card where the creature was demanding your attention. The finger pointing out of frame is kind of an accusation or threat aimed at your opponent. This was a trick I’d do a few times in the future, though most notably with the Demon Token from Mirrodin. 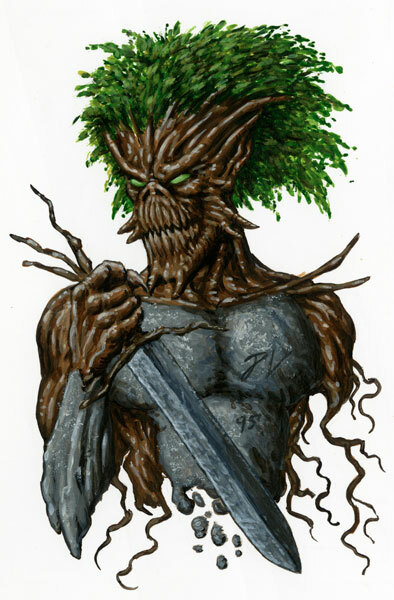 I got to revisit Gaea’s Avenger three times in other pieces. Once in Drawn Together from Unhinged, once in a promotional image that’s never been seen by the public – but that will change sometime in the future – and once for the Duelist Magazine. Here’s the Duelist piece which was painted in 1995. No idea what article it was for but you might notice that I’m up to my old tricks of tucking my signature into the image again. Remember that equation “Goblins + (Fire and/or Explosions) = Hilarity!”? Yeah, still holds true. 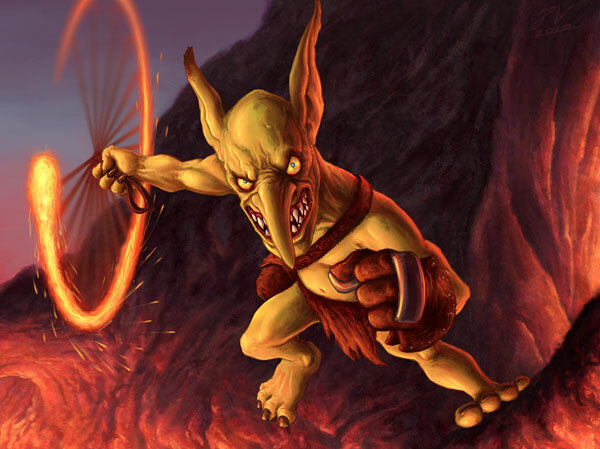 Here’s my one new piece of art in Magic’s 2012 core set – the Goblin Fireslinger. 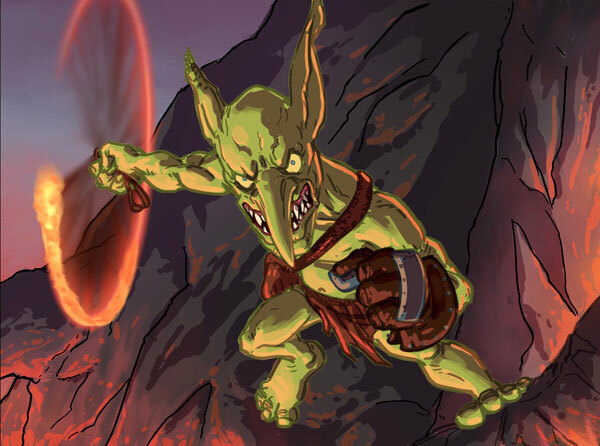 Action: Show a goblin swinging a some kind of goblin sling weapon, in which is a red-hot sling-stone. He looks viciously at the viewer, as if he’s about to bean us in the head with that stone. Mood: An irritating little bugger! I imagine the goblin is on the opposite side of a narrow ravine filled with molten lava. The rock formations at the extreme lower left and lower right are rock bridges and the goblin is doing a fine job of protecting them both. However, it looks like at the moment of this image he’s decided to take the fight to the viewer and is beginning to launch himself across the ravine for a little ‘face-time’. And by face-time, I mean ‘face meets burning rock’. As you can see, most of the goblin drawing is unchanged from sketch to final. His coloring underwent a big transformation because the hot lighting (from the unseen molten lava) was strengthened. This meant the green of the goblin felt more and more out of place with the ambient light in the image so his skin tone was shifted to yellow with warm brown shadows. Because all color is perceived relative to its surroundings, your brain tells you the final version of the goblin is more green that he actually is. Color is a tricksy evil swine sometimes. Ask any artist. And talking of color, take a good look at his eyes. The center of his pupils are a brilliant blue. This might indicate the color of whatever he’s looking at reflected there but it’s really me using the strikingly out of place color to make his eyes more piercing, and that little bit extra crazy. Oh, and bonus points if you noticed the ear on his swinging side is shortened and capped with a singed stump. Hey, swinging burning rocks ain’t easy and every goblin learns it one way or another!